Are you in need of a rolling gate repair or a new rolling gate installing? Are you having trouble with your garage door? Need a roll up-roll down gate installed? Luckily, NYC Rolling Gates is here to help! We at NYC Rolling Gates are available 24 hours a day, 7 days a week! No matter the time, no matter the weather – call us anytime! Your know that rolling gates are your security and protection so we operate accordingly. Our team consists of young, smart and quick technicians and they are at your disposal. All of our staff at NYC Rolling Gates are highly-trained professionals. We only hire in-house technicians and we never deal with freelance contractors. We also take full responsibility, and never charge you extra. We easily supervise our staff, making sure that they keep up with the high standards set by NYC Rolling Gates. We’ve got the best rolling gate team in town and we’re only a phone call away! We offer rolling gates repair, roll up gates and roll down gates repair, garage door repairs and much more. We guarantee the best prices and if you end up finding a lower quote and show it to us, then we’ll match it! Is your Rolling Gate jammed? Need to install a new Rolling Window Gate for your home or place of business? If so, NYC Rolling Gates located at 18 East 46th Street, has got you covered. Available 24 hours a day, 7 days, a week, 365 days a year, we can be reached at 917-439-8428. Our technicians have years of experience under their belts and are dedicated to give you the best possible service for your money. No matter the job, we’ll take it! Choosing the right gate for your home or business is a complex decision. Because Rolling Gates and Rolling Windows are not only made from metal nowadays but wood and special vinyl as well, it’s important you find the right match for you. Size is also important when choosing the type of gate for your home or business. No matter what you end up choosing, our products are built to last as well as providing you with the security that you need. In addition to installing all types of rolling gates and windows, we also repair them. Whether it’s manual or electronic, we can repair it all. So be sure to give us a call today and see why we’re the most recommended rolling gate and rolling window installation company in the NYC metropolitan area. Rolling Gate Manhattan NYC offers professional installation of commercial electric gates, gate operators, gate motors, telephone intercom systems, gate equipment, etc… Rolling Gate Manhattan NYC is known for the design and fabrication of custom electric iron and steel gates. If you need a single gate component installed, or rather, the entire gate system, we, at Rolling Gate Manhattan have a company-wide philosphy to work to provide the best service in New York. Whether it is a commercial grade swinging gate or sliding gate, our professional gate experts can solve any kind of gate operation problem. Many times our customers call us because of a damaged gate from car or truck collision. Since our trucks are equipped with on-board welders, we are prepared to quickly get the gate operational again, or even initiate a temporary fix until a cosmetically ideal repair can be made soon after. We specializes in the repair and service of electric gates, automatic gates, motorized gates and remote gates. We are factory authorized and approved by all major brands to perform, maintain, service and install electric gate openers, telephone entry systems and accessories. 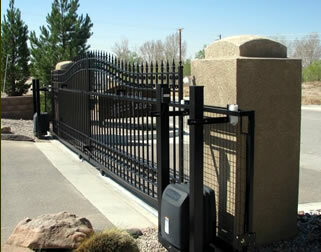 Whether you need to install a single gate component or an entire gate system – we can do it. We take our work very seriously, doing it well, and being suitably rewarded for one’s efforts. Electric Gate Installation: Rolling Gate Manhattan gates professional installations of residential and commercial electric gates, gate openers, gate motors, telephone intercom systems, gate equipment, gate safety devices and other gate accessories. Do you need a rolling gate repair or just a new rolling gate installing? Is your garage door malfunctioning? Do you need a roll up-roll down gate installed? Rolling Gates NYC is at your service! Manhattan Rolling Gates Repair & Installing Service available 24 hours a day! No matter the hour, no matter the weather – call us! Your rolling gate is your security and protection – we understand that and we operate accordingly. Our team of young, smart and quick technicians and service-men is at your disposal. All of Rolling Gates NYC’s staff are highly-trained professionals – we employ only in-house technicians and we don’t work with freelance contractors. That’s right – we take full responsibility, we don’t charge you extra and we can easily supervise our staff, making sure they keep to the high standards set by Rolling Gates NYC. The best rolling gate team in town is just a phone call away! We guarantee the best prices! If you find a lower quote, show it to us, and we will match it! Rolling Gate Manhattan New York was established in 2007, by rolling gates entrepreneurs, whose aim was to actualize years of professional experience and a fresh, dynamic business approach attitude into a viable, successful home security company. Rolling Gate Manhattan New York staff is comprised mainly of young, energetic and highly-trained professionals. Rolling Gate Manhattan New York employs all of its technicians and servicemen in-house and does not work with freelance contractors, which enables the company to keep a level of reasonable prices. Rolling Gate Manhattan New York installation and repair service in New York City for rolling gates, electric gates, roll up doors and many other products. Most rolling gates & roll up doors will simply slot upwards into themselves when they close. The bar elements of the door will simply slot up until they reach their top end to keep them out of the way. When you want to close to door again you can simply pull it down. It will then unfold out of the top casing so you can close and lock the door as you wish. You can also roll these doors part way up or down if you wish. 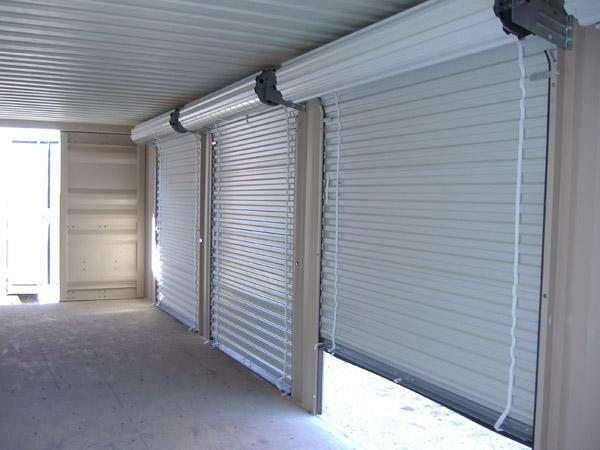 Many rolling gate & roll up doors are used on the exterior of buildings, factories and commercial units. You often see this kind of door used for security as well. Many high street shops will have a roll up metal door that is designed to cover their entire frontage, for example. This will give additional security to the shop and will also help prevent the breaking of their glass and windows. In some cases businesses can also use internal roll up doors. These doors don’t have to be made from metal — many are simply made from special vinyl materials. These doors really do work like giant roller blinds. They can be used for a variety of purposes including for partitioning, for insulation and for keeping out draughts. 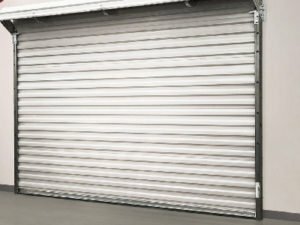 Rolling gate & roll up doors are ideal solutions for many businesses as they can be made to fit large doorways and openings at a lower cost than having a large door specially made. This is a useful solution for many businesses that need to have a large doorway (say, for example, they need to get vehicles or large machinery in and out of the door). It is also possible to use roll up doors in a domestic environment as well. Many people are, for example, opting to replace their garage doors with a roll up model. In a lot of cases these doors will come with a remote control system so that you can have them open and close themselves by pushing a button rather than having to get out of your car and sort the door out for yourself. Our company has especially well trained employees that work locally in all of Manhattan, and New York City Area providing rolling gate repair 24 hour service. We have been installing & repair and servicing roll up doors, gates, security grills for stores, homes, and businesses throughout New York City area for many years. We have an immediately response time and will provide 24 hour emergency rolling gate repair service 365 days a year, no matter how big or small your job is. Our employees are trained and experienced in all rolling gates & storefront gates.